When it comes to restorative dental work, you have quite a few options to choose from. Your dentist could recommend a bridge or a dental implant. For many patients, cost is a major factor in deciding which option to go with. Here is some information about the cost difference between a dental implant and a dental bridge in the event a root canal is not an option. Dental bridges cost somewhere between $700 and $1,500. It is a quicker procedure than a dental implant, as it can be completed in a visit or two over a short time period. The dentist will place a dental bridge over the gap caused by a missing tooth. The average cost of a dental implant is between $1700 and $4000. However, depending on the tooth’s location in your mouth and whether a bone graft is needed to place the dental implant, the cost could be much higher. There is also the cost of the abutment and crown placed on the dental implant site to consider. You’ll need to come back into the dentist’s office several times over the course of several weeks or months to allow the implant time to heal. In the short term, dental bridges are generally less expensive than dental implants depends on the dental insurance coverage. Not everyone has enough bone material, even with bone grafting, to place a dental implant. In this case, a dental bridge would be preferred. However, dental implants are considered a better long term option. 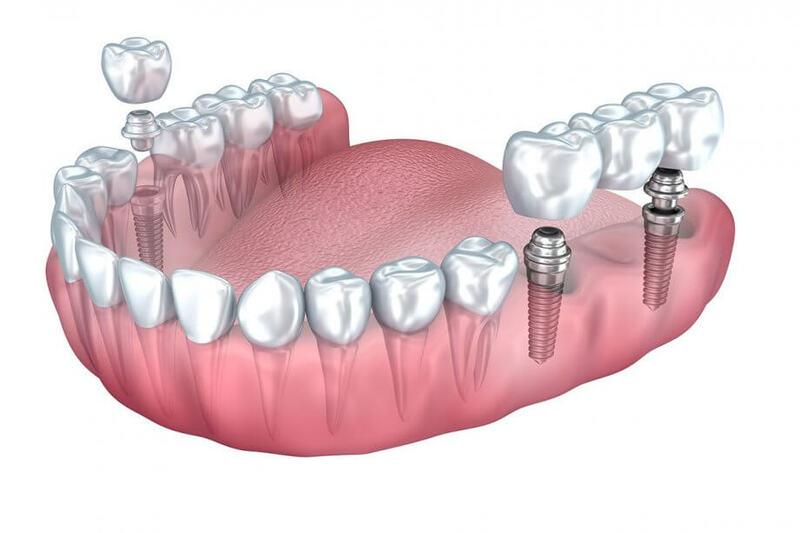 It is unlikely that you will ever need to replace the dental implant. You may end up needing to replace the crown many years later. Despite the fact that dental bridges are less expensive than dental implants, most people benefit from a dental implant, if cost isn’t a factor. Dental implants look and function like natural teeth. You won’t need to worry about teeth shifting in the same way you might with a bridge or that it will fall out. Dental implants last longer and help to preserve your jaw bone. They look better and chew like normal teeth. To the untrained eye, spotting a dental implant isn’t easy. Most dentists would agree that if a dental implant is possible, it’s a procedure that is worth the cost for its benefits. Dental insurance or dental discount plans could help to reduce how much the procedures cost. Not all dental insurance plans cover dental implants, although more are starting to. If you are in Lodi, and you are ready to learn more about dental implants or dental bridges, please contact Dental Associates of Lodi today at (862) 247-8030 to schedule your initial consultation.